Your personality, values, passions and gifting converge in a sweet spot that can shed light on your God-ordained, God-inspired vision and mission for your life. 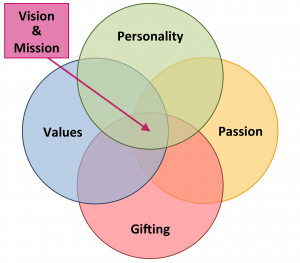 Would you like to discover or refine your personal vision and mission? What were you put on this earth for? What were you uniquely designed for? What legacy would you like to leave? What will you do (your mission) to see your vision become a reality? I love coaching women around this topic. Having done the work myself of writing a vision and mission statement for my life and having experienced the direction, motivation and focus it gives me, I am eager to help others discover their vision and mission as well.